THE BIGGEST HELSINKI SUSHI BUFFET! And we do care about our food and our customers! We are a family friendly Japanese cuisine restaurant with reasonable prices and a very large selection of different sushi. Our chefs are passionate in what they do and we travel a lot to see what is happening in the world of sushi to stay one step ahead in terms of food but also in terms of customer service. Based on customer reviews, we are now rated as in 4.5 / 5! We would like to thank all our customers who participated in the reviewing process. We are humble and grateful that you are this satisfied with us and we will continue to improve our services, because we are aiming for the full 5! 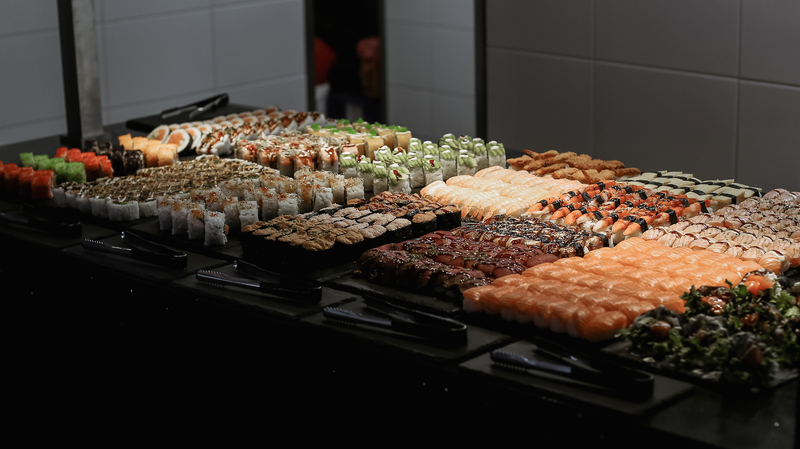 MORE THAN 100 DIFFERENT TYPES OF FRESH FOOD INCLUDING SUSHI BUFFET AND WARM DISHES! With us, everything starts with respect towards great food and our customers. We want everyone to be able to find their favourite dishes from our selection! That is why we offer separately vegan options, salads and fresh sushi in all it´s different varieties including specialities like Temaki sushi. In addition we weekly prepare a variety of beautiful warm dishes like duck, beef, chicken and shrimp in different sauces, noodles, fried and boiled rice and of course our delicious Miso soup. And of course you can end every meal with our desserts. We feel like we are never ready – we always want to surprise our customers with something new and delicious! GET DIRECTION AND STAY TUNED!